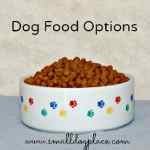 On this Pro Plan Focus Dog Food Review, the specific brand we will be discussing is the Toy Breed Formula. Dolores V. from Florida, U.S.A. Writes: Can you provide the Grades for Purina Pro Plan, Adult Toy Breeds. 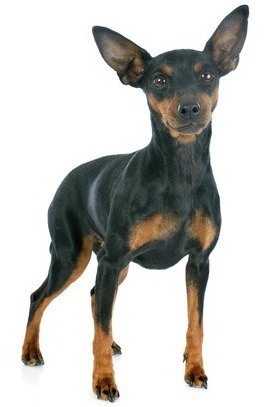 She owns two Miniature Pinschers under 10 pounds. The Nestlé Purina Pet Care Company makes a large assortment of products for every conceivable need. 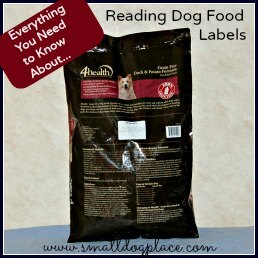 Depending on the size, age, or the health status of your dog, there is probably a Purina Product labeled to meet your dog’s needs. The line of foods contain dry as well as canned foods, and include both high and low end foods with a wide range of prices. What we want to know is whether all of these blends for small dogs are nutritious and healthy for your dog. For the purpose of this Pro Plan Focus dog food review, we found three formulas of Purina Pro Plan that might be appropriate for small dogs. 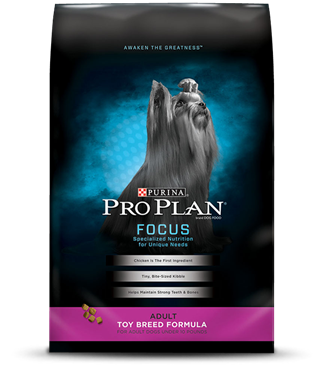 Since it would be too confusing to review all three blends, for the purposes of this review, we will concentrate on the Pro Plan Focus Toy Breed Formula. It is interesting, however, to note that all three mixes are very similar. -Lost 3 points because there are less than two meat sources in the first three ingredients (there are a total of three sources of meat protein, but the other two sources are listed farther down on the list. Based on this scale, Pro Plan Focus Dog Food Review gets low marks. This company is the biggest pet food company in the U.S and the second largest in the world. They sponsor numerous pet events and charities and have been recognized for their sustainability practices during the manufacturing process. Food can be complete and balanced but still not contain the best quality ingredients. In this Pro Plan Focus Dog Food Review, we found the following. Chicken: The first ingredient is chicken. Ingredient lists show food items in descending order according to weight. The weight of whole chicken prior to processing is hefty because it contains much water. After the water has been removed, the amount of chicken is much less. Plant Protein Sources: Most of the protein in this food comes from plant sources: rice, corn, and wheat. Since corn is listed as two of the first five ingredients, it's safe to say that the food contains a large portion of corn. Other Protein Sources: In the food’s favor, it should be noted that the ingredient lists fish meal and dried egg product both of which are excellent sources of protein. Sadly they are in 8th and 9th positions on the ingredients list. This indicates that they are not included in sufficient quantity. Animal Fat: Animal fat is considered a problem using this scale, but it is actually a good product. It adds to the taste of a food which is important for finicky eaters. Chicken fat is high in linoleic acid which is an Omega-6 fatty acid. If the specific animal is not listed (chicken), you will not know what type of poultry was used (chicken, turkey or some other bird). It could come from dead zoo animals, dead on arrival poultry or worse. Since these sources are controversial, it is better to avoid foods that do not specify the animal source. Most of the ingredients after the main ones are those of vitamins and minerals. It is important to note that many of the vitamins were added back into the mixture after processing. When you see ingredients such as, "Vitamin B 12 supplement," you know that this vitamin did not come from any food ingredient. It is healthier to obtain minerals and vitamins directly from food. in the Pro Plan Focus Dog Food Review, we noticed a total of five vitamins that had been added back to the formula after the food was processed. Their AAFCO Statement states that Their formulas are complete and balanced for the age of the dog, which means that the food provides all the necessary nutritional needs for dogs. We must give credit to the Nestle Purina company for doing feed trials. We know that the company has done at least one feeding trial based on their AAFCO Statement or Nutritional Adequacy Statement. A feeding trial is a test performed on at least 8 healthy dogs for a period of six months. Dogs in the feeding trial are examined by a veterinarian before and after the trial, weighs are taken, blood samples drawn and a pre-measured amount of food is served and recorded daily. Feed trials are considered superior and more costly to the company than other options such as laboratory testing. The down side to AAFCO Statements containing feed trials is that most manufactures have more than one product. Purina has a substantial number of products. The manufacture is allowed to use this statement on all of its products if at least one of their foods meets the criteria providing that the other foods displaying the statement provide the same or greater amounts of nutrients. There is really no way to tell if this particular product went through a feeding trial. Dry Matter Basis (DMB or DM) is a good way to compare the amount of protein, fat and carbohydrates in a food. This calculation removes the water leaving the actual nutrients in place. It is not fool proof though. The guaranteed analysis values are used but the values listed are either minimums or maximums. If fat is listed as a minimum of 17% it may actually have more. The Purina company has been around for a very long time. The original company can trace its roots back to the nineteenth century. Many of us grew up feeding our dogs Purina Dog Chow because there was little else on the market. Now the company is very involved in the world of animals sponsoring dog shows, providing veterinary health products to animal hospitals and assisting breeders. Their publications, read widely by dog and cat fanciers provide information concerning health, nutrition and reproduction. Breeders are able to obtain free packets of food and puppy kits to give to their buyers. There are also rebates provided for high volume buyers. The brand is used widely among show dog folks. Unfortunately the brand does not score well using the scale we use on this site. To be sure, there are few people who have not heard about the Purina brand, it is readily available and the cost is competitive. Each product should be evaluated separately but it seems that Pro Plan Focus Toy Breed Formula is lacking in quality.